Henry Rowlands is an anti-biotech activist and consultant based in Sofia, Bulgaria. He has spent most of his career promoting the “sustainable movement” in various capacities. Starting in 2011, Rowlands waded into the GMO debate to help the organic industry finance and promote research that casts doubt on the safety of transgenic food. The organic industry has long tried to scare the public out of consuming produce treated with synthetic herbicides like glyphosate. To arouse the public’s concern, the industry, largely led by the Organic Consumers Association (OCA), has financed studies with predetermined conclusions and worked tirelessly to promote this activist science in the press. Henry Rowlands is the consultant the OCA relies on to orchestrate these fear-inspiring campaigns. 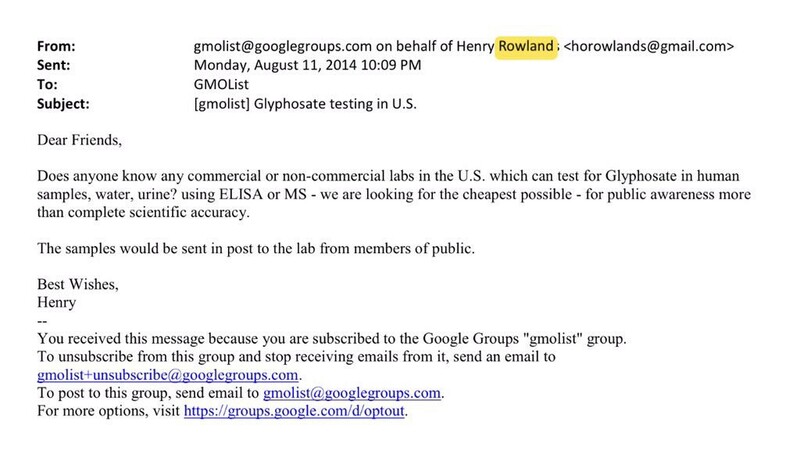 HRI Labs is now a participant in The Detox Project, a for-profit certification platform established by Rowlands “that brings awareness to the public by testing for toxic chemicals.” In plain English that means bullying food producers into eliminating the use of glyphosate-treated ingredients. Companies that don’t comply may be in for serious public relations trouble. The public got its first look at how this conspiracy could play out when the New York Times ran a story claiming that several Ben & Jerry’s ice cream flavors contained trace amounts of glyphosate. The OCA has wanted the ice cream manufacturer and other food companies to eliminate pesticides and transgenic ingredients from their supply chains for years, and, conveniently, HRI Labs was hired to conduct the tests that found glyphosate in Ben & Jerry’s ice cream. Beyond the obvious conflict of interest in play, plant geneticist Kevin Folta noted some very serious technicals errors in HRI Labs’ work, emphasizing that they did not report their methodology and their results were not peer reviewed. Folta also criticized the Times for failing to ask any questions about the reliability of the test results, and trusting paid activists to fairly explain the situation. The Times rightly noted, for example, that the amounts of glyphosate found in the popular ice cream flavors were far below the safety thresholds set by the federal government, but then quoted OCA Chairman Ronnie Cummins: “‘Not everyone agrees with the acceptable levels governments have set,’ Mr. Cummins said. ‘And, anyway, would you want to be eating this stuff at all?’” The Times story also suggested that there is debate among experts around the safety of glyphosate, which is simply incorrect. Whatever organic activists and the media may say, there is little doubt that glyphosate is safe.